Since the Maya territory covers such a vast territory, it includes many ecological zones. Some coastal areas have a tropical environment, the highlands experience quite chilly temperatures and the Lacandon area is classified as a rainforest. Each Maya group adapted to its particular environment. For example, the Yucatan peninsula can be quite hot and humid. The Maya here live in more open house structures, wear lighter weight cotton clothing, can harvest several crops a year and depend on crops that would never flourish in the colder climate of the higher elevations. In colder areas, like the Guatemalan highlands, Maya people have adopted a way of life that successfully exploits what this colder climate has to offer. Houses can be more substantial, since a tropical storm isn’t likely to destroy them, and clothing is made of cotton as well as wool, a much warmer fiber. Climate is not the only factor dividing the Maya. Today’s Maya territory falls within the boundaries of several nation-states. 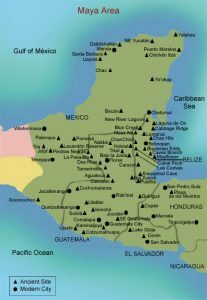 Most Maya live in Mexico and Guatemala, but there are also Maya living in El Salvador, Honduras and Belize. Because of these national divisions, the political situation for Mexican Maya can be quite different from that of Guatemalan. For example, one of the biggest problems facing those in Mexico is lack of access to farmland. In response to this, the Zapatistas, a guerilla army composed of peasants and some Maya, have protested and called for land reform in southern Mexico. In Guatemala, Maya have joined together in a pan-Maya movement to protest the human rights abuses they have suffered at the hands of paramilitary forces acting in concert with the national government. In both cases, the Maya have emerged as forces to be dealt with on a national level. The map above shows the modern national boundaries that divide the Maya.